New Delhi: Mercedes-Benz has invested over three billion euros in the development of its new engine technology. The German luxury automaker said that the new family of diesel engines currently meet the Real Driving Emissions (RDE) norms, a new stricter emission limits planned for the EU (European Union) as of September 2017. 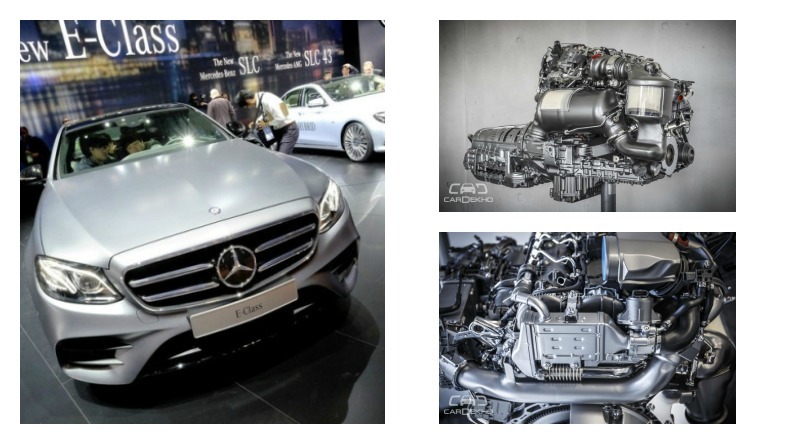 The first iteration of this new family of diesel engines, OM 654, will find its way in the next-gen India-bound 2017 E-Class. The automaker claims that the new 1,950cc (2.0-litre) oil burner in the 2017 E 220d now consumes as little as 3.9-litres of fuel per 100 kilometres (as per combined New European Driving Cycle — NEDC). Despite a considerable increase in power of nearly twenty horses compared to its predecessor, the CO2 emission of the new engine stands at 102 grams per kilometre. The new 2.0-litre diesel is an all-aluminium unit (first for Mercedes-Benz), and the reduction in emissions and updated power output are courtesy of the stepped combustion chambers and further developed exhaust-gas recirculation (EGR). The new engine layout has allowed all the components of the EGR to be positioned directly in the engine, instead of under the car floor as it was previously done. This has significantly increased the system’s effectiveness. For the petrol engines, Mercedes-Benz will become the first manufacturer in the world to incorporate the large-scale use of particulate filters. The automaker highlighted that with over two years of positive field tests with the Mercedes-Benz S 500, additional petrol versions of the S-Class are to be equipped with this new technology in the next model upgrade. “That’s why we decided five years ago to invest massively in the further development of diesel technology. But we are also continuously making our gasoline engines more efficient and more environment-friendly; because high-tech combustion engines will remain the backbone of individual mobility until the widespread market success of electric vehicles. For this reason, we are investing a total of about three billion euros to ensure further improvements in fuel consumption and emissions – in both future and current vehicles,” he added further. When is the new e class being launched in India?